Finding dog food for senior dogs isn’t difficult at all, in fact there are many formulas specifically designed with older dogs in mind. BUT, just like younger dogs, seniors are not all the same, and no one single dog food formula is going to be the right choice for every golden oldie. It’s up to you to choose one that has the right balance of ingredients for YOUR best friend. 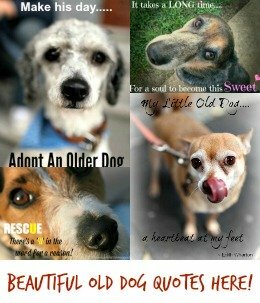 This page features the premium brands and very best formulas for senior dogs of all sizes/breeds.. and who are in overall good health. DHA – Omega-3 fatty acid protects eye and brain health. If your older dog is in generally good health (no heart, kidney, liver or weight problems, and isn’t diabetic) then a premium adult dog food is still an excellent choice. At this point there’s no real need for the reduced fat/protein levels in most senior dog foods, but for a healthy dog they can still be a healthy option. Many owners feel reassured by the fact that these formulas have the ‘old dog’ in mind, and that can’t hurt. Here are some of the best quality adult dog foods on the market…. Small, toy and miniature breed dogs have different nutritional requirements from their bigger dogs… and that remains the same even in old age. Little dogs generally need a formula that is energy-dense and high calorie. This means higher levels of protein and fat. To help keep their blood-sugar levels balanced, and avoid hypoglycemia, they also need extra fiber. The fact that these formulas are manufactured with smaller kibble pieces is also important… especially for puppies and senior dogs. 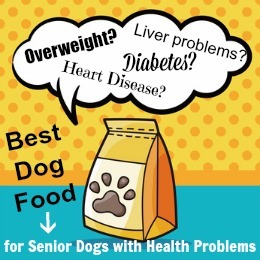 For healthy seniors in this group, an adult dog food that is specifically formulated for small breeds is a good fit. Here are a few of the best…. 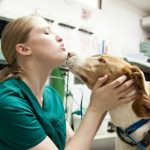 Large and giant dog breeds have their own unique dietary requirements, and dog food formulas take that into account. For a healthy, older dog in this category a formula specifically designed for large-breed adults is a good choice. Many of the large-breed senior formulas tend to be aimed at weight-control, and if your senior isn’t overweight then he/she doesn’t need a low-calorie or low-fat diet. But if Fido is on the heavy side, and is also a senior (bear in mind big dogs live shorter lives, so getting old happens faster for them) then a senior formula can fit the bill too. Both adult & senior formulas for large breeds have bigger kibble pieces, designed to bigger mouths and discourage ‘chow hounds’ from gobbling it all down (this is only minimally effective in my experience!). Here are some great options…. Natural Choice Wholesome Essentials, Large Breed Snr. As a general rule, I personally feel that canned dog food is only a reasonable choice for small and tiny breeds, weaning puppies and senior dogs (either tiny ones, or those with dental problems). Canned food has less nutrition per cup than dry kibble, and large and giant breed adults usually can’t eat enough canned food to get the amount of nutrients they need to stay healthy. Plus, canned food doesn’t help keep teeth/gums clean and healthy, and jaws strong. BUT it does have a role to play for certain dogs, and at certain ages. If your senior dog is a little ‘un, has difficulty chewing, or is picky and needs to be encouraged to eat, then a premium canned dog food might be a good choice.